Deep Water Shoal – Chesapeake Chapter U.S.L.H.S. The first Deep Water Shoal Lighthouse was built in 1855 on the James River northeast of Fort Eustis on the shoal on the right side of the channel, above Mulberry Island Point and below Lyon’s Creek. The light was first exhibited on February 6, 1855. It was a small, twenty-foot square, four-room white dwelling with a red tin roof and black lantern. It was equipped with a large sized pressed glass masthead or steamship lens hung in the lantern room, exhibiting a fixed white light. The lighthouse was also equipped with a hand operated fog bell. The five, solid wrought-iron red piles supporting the structure were five inches in diameter and screwed a total of ten-feet into the river bottom. During its first year of operation, the light suffered severe damage by ice and violent storms. During the Civil War, the lighthouse was attacked and damaged by Confederates in 1862. The lens lantern, along with numerous supplies were gone. After installing a new lantern later that year, the light was deemed no longer necessary, and the lighting apparatus was taken down and stored at Fort Monroe. After the war, the station is fitted with a new lighting apparatus and fog bell and put back into service. Because the lighthouse was located on the edge of a shoal, ice flowing into the channel would build up against pilings. On January 20, 1867, the lighthouse is destroyed by ice floes. Until a replacement could be built, Lightship No. 25 was placed at the station on November 9, 1867. Construction of a new lighthouse was built away from the edge of the shoal and is completed and first exhibited on January 15, 1868. It was a hexagonal shaped, white screwpile lighthouse with three rooms and supported on eight wooden piles fitted with cast iron sleeves. It was equipped with a sixth-order Fresnel lens with a fixed white light and machine operated fog bell. In 1878 the fog bell was fitted with a Stevens striking mechanism which struck every fifteen seconds. 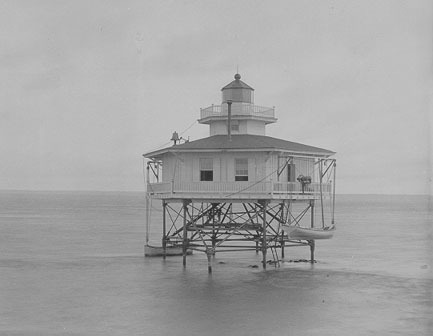 After many complaints of poor visibility, Fifth District Lighthouse Inspector Train requested that Funck-Heap lamps be installed in all James River lighthouses in 1892. This was a standard Argand lamp with a single wick that was fueled by whale oil. The lighthouse was deactivated in 1936 and torn down in 1966. It is replaced by a daymark on a skeletal tower on the original screwpile foundation. Keepers: James H. Ransom (1854 – 1860), Allen Hogg (1860), William Anderson (1865 – 1867), William Anderson (1868 ), Cornelius Merton (1868 – 1870), Robert B. Mitchell (1870 – 1873), J.F. Leburn (1873), William E. Crockett (1873 – 1874), Santa A. Morse (1874 – 1885), Theodorick Bland (1885), Benjamin Fenner (1885 – 1888), William M. Colgin (1888 – 1889), William Walker (1889 – 1891), James B. Hurst (1891), Edward W. Lee (1891 – 1894), Charles E. Respass (1894 – 1897), Josiah J. Wilson (1897 – 1900), James T. Parks (1900 – 1907), Alexander P. Hurst (1907 – 1928), A.J. Quidley (1928 – 1929), George G. Johnson (1929 – 1935), A.F. Ripley (1936 – 1936), John R. Edwards (1936 – 1943), Thomas J. Cropper (1943 – 1944). Assistant Keepers: Thomas Ransom (1854 – 1856), W.J. Barrett (1856), William F. Ransom (1856 – 1857), Dempsey M. Crumpler (1857 – 1858), Washington Joynes (1858 – 1859), Allen Hogg (1859 – 1860), Isaac F. Morrisett (1860), John Howard (1865 – 1866), Robert Howard (1866 – 1868), Cornelius Merton (1868), Virginia Hobbs (1868 – 1870), James O. Wakefield (1870 – 1871), Frederick Aldridge (1871 – 1872), William Brown (1872 – 1873), Isaac F. Leburn (1873), S.A. Morse (1873 – 1874), Thomas Hunt (1874 – 1876), Samuel T. Jones (1876 – 1877), Edward T. Hill (1877 – 1879), E.H. Brown (1879 – 1885), Benjamin Fenner (1885), Thomas E. Fenner (1885 – 1887), William M. Colgin (1888), William H. Jones (1889), Alphonso Royster (1889 – 1890), Edward W. Lee (1890 – 1891), John Cary (1891), Charles H. Brown (1891 – 1894), Josiah J. Wilson (1894 – 1897), Walter S. Hudgins (1898 – 1902), Olaf A. Olsen (1902), Walter C. Joynes (1902), Henry H. Wingate (1902 – 1903), Arthur L. Small (1903 – 1906), Charles S. Hudgins (1906 – 1907), Robert F. Powell (1907 – at least 1913), Harry O. Monsell (1914 – ), Thomas J. Crapper (at least 1915 – at least 1917), Robert H. Matthews (1918 – 1920), John W. Casey (1920 – at least 1921), Utah C. Jennett ( – 1924), Amasa J. Quidley (1924 – ), J.W. Simpson (at least 1930), Thomas J. Cropper (at least 1930 – at least 1940). 1. Annual Report of the Lighthouse Board, various years. 2. Forgotten Beacons, Patrick Hornberger & Linda Turbyville, 1997.